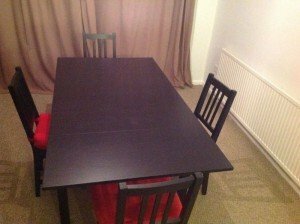 A black solid wood extendable dining table and four matching dining chairs, together with four red chair cushions. A four piece Chesterfield sofa suite, comprising a three seater sofa, a two seater sofa, an armchair and a square storage footstool. A three piece vintage sofa suite, comprising a three seater sofa on a solid wood base and two matching armchairs. 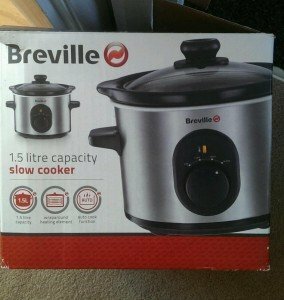 A brand new boxed Breville stainless steel and black 1.5 litre capacity slow cooker. 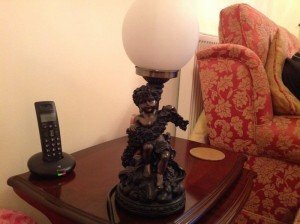 A vintage style painted black solid wood table lamp, depicting a cherub with a rose garland. 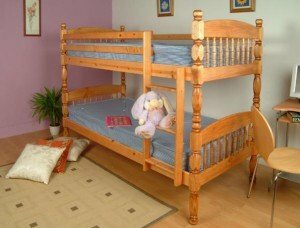 A solid wood bunk bed and two single mattresses, together with a large area rug and various cushions. 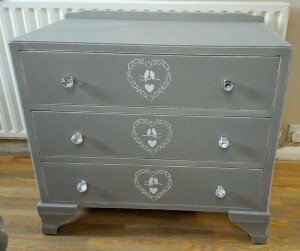 A small hand painted grey chest of three drawers in the shabby chic style, having two diamond knobs to each drawer. 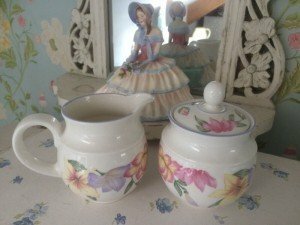 A large Royal Doulton lady figurine, a royal Doulton milk jug and matching lidded sugar bowl. 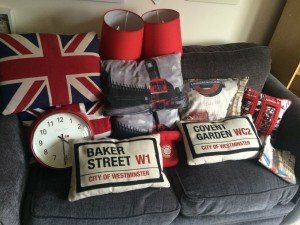 A collection of United Kingdom decorative home accessories, to include various printed sofa cushions, two table lamps, a telephone shaped doorstop and a wall clock. 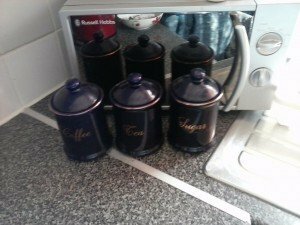 A Russell Hobbs stainless steel and glass microwave, together with ceramic tea, coffee and sugar canisters. 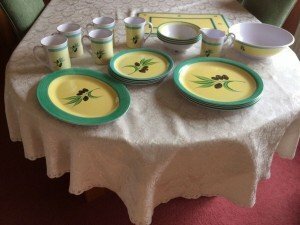 A vintage Melamine ceramic yellow and green dinner service, comprising dinner plates, cups, bowls etc. 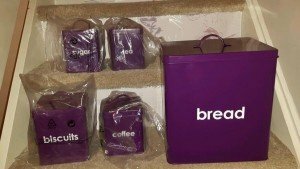 A set of five purple and white metal kitchen canisters, including a large bread bin, a biscuit tin and tea, coffee and sugar canisters. 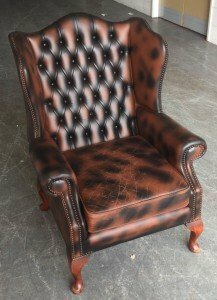 A vintage Chesterfield wing back gentleman’s armchair, upholstered in brown leather. 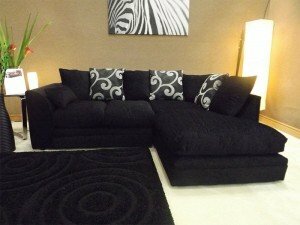 A large four seater corner sofa upholstered in black suede, together with three decorative cushions and a large area rug. 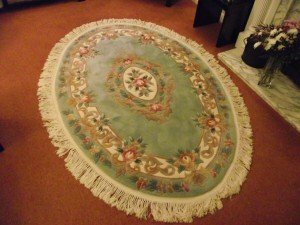 A large oval Chinese style decorative area rug, depicting colourful floral patterns against a blue ground, fringed all around. A large five seater corner sofa on square chrome legs, upholstered in red faux leather. 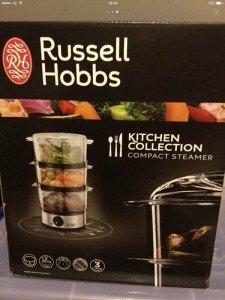 A brand new boxed Russell Hobbs stainless steel and plastic three tier compact steamer. 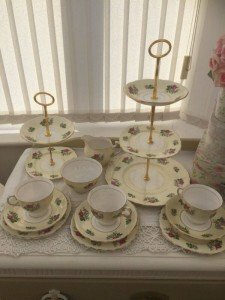 A vintage fine bone China tea service decorated with a floral design, include two cake stands, a milk jug, a sugar bowl, three tea cups etc. 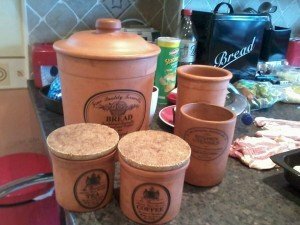 A collection of Mrs Brannam kitchen storage jars, including a lidded bread bin, two utensil holders and a tea and coffee jar. 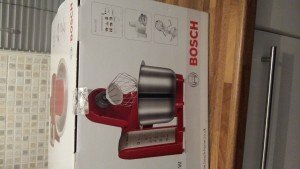 A brand new boxed Bosch red and stainless steel food processor and mixer.